It's almost time for Paris in July, 2013 edition. I've enjoyed dabbling in a few books each July since Karen at Bookbath and Tamara at Thyme for Tea started it. During the month of July, read your book, eat some food, watch a movie. Something French. Murder in Montparnasse by Kerry Greenwood. It's a female detective series that I enjoy, starring Phryne Fisher, set in 1920s Australia. I'm going with the fact that the Eiffel Tower is on the cover that there will be some connection to Paris. Looks like a fun, intrigue-based spy story, chick lit style. Young Jackie Bouvier (Kennedy Onassis) is recruited by the CIA. I added it to my library list after last year's challenge so someone must have enjoyed it. Madame Bovary goes on my list every year, although I can't see me getting it read at all. Similarly, I've got Madame de Stael on a dailylit.com account that I still haven't finished. Maybe this July! It's not quite the same thing, but we are planning to go to Quebec the first week of August, staying in Quebec City one night, and then a week at Sherbrooke for the Canada Games. Go PEI Basketball! It'll be the finale to Paris in July - my very own Quebec in August! Check out The Broke and the Bookish for more links and future TTB lists. I love these TBR lists, and I've been making them to remind me of books I really want to read before I get distracted by other shiny new books. This is a good mix of new books, books I've bought, authors I like love, library books, and reading challenges. Looks like a great summer! John at the Book Mine Set has made his list (inspired by other lists) of the books that should be read to be a well read Canadian. Or to be Canadian well-read. I guess it goes either way. I've read 37 which seems alright, but wouldn't be a passing grade. How do you do? It's a ready made list for the Canadian Book Challenge if you want to join. I watched Jon Stewart's last show before his hiatus from The Daily Show. He showed a clip* of Jason Jones in Iran in 2009, during the revolution and protests before the 'democratic' elections. One of the reporters they talked to was subsequently arrested. Stewart and the show had become friends, and after his eventual release, and book writing, Stewart decided to make a movie based on the events. That's what his hiatus is for, and it is also the subject of this book, sort of. The revolution and protests of 2009 mirrored the revolution and crack down that happened in the 1980s. Starting in Evin Prison in 1983, a child is born to a prisoner. Delijani immersed the reader in the scene - the fear, the confusion, the horror. Several stories are followed in the 1980s, from connected young people who have been imprisoned, and their young children who are looked after by other family members. Some of the prisoners survive, some don't. Some left Iran, some stayed. Twenty odd years later, the children are grown, and living their own revolution, and also the effects of having parents who were in prison for the same revolution. It was a beautiful book, and reminds you that an 'axis of evil' represents a government and its leaders, not the people. Iran had been a well educated, vibrant country with women who had vital roles in society. Then, bam. A totalitarian government, fundamentalist religiously based changed all that. The people are still fighting, still rebelling as best as they can. The fact that a new generation who grew up under Khomeni still turned out in numbers to protest showed that the brainwashing of a generation did not take. It's a book that brings history, and modern events to life. As I read, I enjoyed the story and the people, but at all times, recognized that as much as it is a novel, it is also what has really happened to real people. It's all the rage to write a fictional autobiography from the perspective of a famous man's wife. (The Paris Wife - Ernest Hemingway's first wife; The Aviator's Wife - Charles Lindbergh's wife; even vaguely American Wife by Curtis Sittenfeld from a few years ago.) As long as they're as good as the ones I've read so far, I say keep 'em coming. Note to self - find The Aviator's Wife. I loved Zelda! It was told from her perspective, from how the author interpreted events. We zip from the Southern US to New York, flapper life, the famous time in Paris, and the eventual destruction of some lives. Sure, Zelda probably had bipolar disorder, but much like many women in the 1930s and 40s who were institutionalized, it was that they weren't towing the male line. Imagine wanting to create in her own right and name and not just as Scott's wife? I thought it was interesting that in the author's notes at the end, she mentions how much of the mythology of Scott and Zelda Fitzgerald is based on what Ernest Hemingway wrote about them in The Moveable Feast, and he certainly wasn't a Zelda fan. have to read a Coupland this challenge to commemorate this. I adored Hey Nostradamus! and Eleanor Rigby and All Families are Psychotic and Generation A. Plus, the Canadian Souvenir books, and the Terry Fox book. I want to read JPod, Microserfs, Miss Wyoming, or Girlfriend in a Coma. Head to The Book Mine Set to get more details and to sign up. Flight Behavior, State of Wonder, Intuition: a trifecta of Orange nominated, well written, science based books. Something also about their readability - not character driven, not particularly plot driven, but characters grow and change, and there is a page-turning aspect to the plot - what will happen next? I didn't loove any of the three, and yet, I quite enjoyed reading each of them, and found them very engaging. Kingsolver (of The Poisonwood Bible fame) writes this one closer to home - the mountains of Appalacia, and her environmental concerns. The last Kingsolver I read was Animal, Vegetable, Mineral, her non-fiction account of living strictly off her own land, self-sufficiently. Plot - Monach butterflies appear on a Tennessee hill destined for clear-cutting, which would provide some much needed money. Dellarobia, the married at 17, stay at home mother of two, has been feeling stifled, and becomes involved in the butterflies when the scientists come to study them. The book is maninly Dellarobia, and her growth and self-examination. You cheer for Dellarobia as you read, hoping for her to find what she needs in her life, to stretch her intellect, and reach her potential. Best part - a guy who comes to hand out leaflets (the mountain becomes quite a magnet for all types of protesters) for ways to lower a person's carbon footprint. As he explains all the tips to Dellarobia, the conceit of the rich and middle-class who need these tips to assail their guilt at the damage to the environment becomes laughable. he ends with - fly less. Less? she says. Top Ten Books at The Broke and the Bookish is Featuring Travel In Some Way (road trips, airplanes, travelogues, anything where there is traveling in the book!) 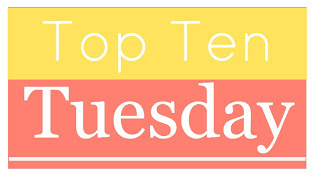 Check out here for more Top Ten Tuesday posts. Did I forget any great travel books?